A FIRST-HALF brace gave Academy the perfect start to their title challenge. Stephen Anderson stunned the visitors in opening minutes with a well-placed header but despite pressing for their second, it didn't come until the dying seconds of the first period. Richard Macadie put down a marker for a regular team place this season, finding a path through the congested defence with a well place ball. Today saw probably the biggest ever convoyof Landrovers to make the trip from Landsend to John O'Groats. All in the aid of three charities the crews havehad a great time meeting each other. A few are also now heading off to do the North Caost 500 as they have already completed the east coast part. 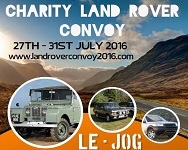 Over 270 landrovers took part and we may have missed a few as John O'Groats was extremely crowded today. There are many photos in our gallery. Royal Scots Dragoon Guards pipe band for 2016. This is the first time that the military band has played at Halkirk. 9.30pm Bonfire Lantern Walk. Meeting at the Lantern Tent at Riverside, behind the side-shows. Lanterns available, £3. Wick Councillor Bill Fernie and Caithness area committee shairman Coucnillor Roger Saxon recently visited the construction site of the new Wick High school. They saw round the school and looked at the recently mentioned problematic beam on one seciton of the roof. The beam will be replaced and the councillors were told it is unlikely to hold up progress at this stage. The constructions site at Wick High school is offering pallets to anyone who can collect them. They have built up over the months and unlike inthe south the comany cannot dispose of them easily to other firms. They are offering them free to anyone who can collect them. They come in various sizes andor are likely to arrive as materials are coming to the site every week. Some twil go to the Wick Gala Bonfire but many wil stil remian for anyone wha wants them. Contact the site office initially to arrange a collection time and day. INTERMITTENT rain failed to dampen the imaginative enthusiasm of entrants at the fancy dress competition at Braehead - one of the most popular events in Wick Gala Week's packed programme. WORZEL Gummidge would doubtless have dismissed it as the last straw...scarecrows deserting their field posts to show themselves off in town.. Goodness knows what Aunt Sally would have said. But surely she would have relented and allowed the bird scarers their moment in the limelight, seeing as it's all in a good cause - Wick Gala Week. Photo Gallery We will add more if we find them as we go abut the town. Send in any to bill@caithness.org for inclusionin the gallery. Thanks to Alistair Sinclair for another batch of Wick Gala photos. Who can you spot in this latest collection now added. This short video wil show you some ofthe spectacular places you can see on a trip with Caithness Seacoast from Wick harbour every day. If anyone wishes to add any special photos of the night then email them to bill@caithness.org to add to the gallery. The four turbines bound for Lochend Wind Farm at Barrock, Caithness have been unloaded at Wick Harbour awaiting transportation. Lochend Wind Farm comprises 4 x 2300Kw Wind Turbines With A Height To Tip Of 99.5M, Height Hub Of 64M, Rotor Diameter Of 71M. The Pulteneytown People's Project is delighted that Central Superhero Events will be coming to the Pulteney Centre on Friday 5th of August 2016 with their Superhero Shows. Come along with your kids and meet the famous central superheroes Batman, Spider man, Captain American, Hulk, Iron Man and Transformer Bumblebee. Tickets From Pulteney Centre. A week packed with events starting with a run on Saturday and the Gala night parade. Throughout the week there are events for all ages and families so check it al out and get out and about in Wick.. The Highland Council is to throw open the doors of 30 Princes Street on the corner with St John Square in Thurso on Saturday 16th July 2016 to give members of the public, councillors and community councillors the chance to see how it has restored and brought back into use this iconic Category B listed building which sits a prime position within the conservation area of the town. Originally constructed in the early 1800s, over a period of time, lack of maintenance led to the demolition of the chimney head and the rear stair tower. The building became an eyesore and in order to save it, The Highland Council acquired the building by Compulsory Purchase. The Latheron Show was held in Lybster due to the soft ground at the usual venue. The day was cold but the rain stayed away if only just but it did not put off the entries or people making Lybster busier than any day of the year. HIGHLIFE HIGHLAND AND THURSO SQUASH, TENNIS AND RACKETBALL CLUB INVITE YOU TO TAKE PART IN THE GREAT BRITISH TENNIS WEEKEND. All the equipment necessary will be provide for you free of charge. Come along, take part and have some fun learning tennis skills through drills and games under the guidance of our local tennis coach, Carole Cameron, and tennis leaders. Due to wet weather in recent days the Latheron Show has had to have a change of venues. As last year the show will split between Lybster and Halkirk. No entry fees will be charge but donations will be gratefully received as this will be the second year the show will make a loss. Cattle and sheep judging wil take place behind the Portland Hotel, Lybster. Flower show wilbein the Lybster Hall. Crafts will be at Lybster Golf Club while poultry wilbe judged at the football pitch. Horse events will take place at Northfield Livery Stable at Halkirk. A circus act Fire and Sparks will be in Lybster as well as the Animal Petting Zoo from Glasgow. Atlantis, a global leader in the tidal power sector, is pleased to announce a major technical milestone for its flagship MeyGen project in northern Scotland. The MeyGen project is now connected to the 33kV Ness of Quoys distribution network following the successful installation of one of the longest underground 33kV power export cables in the UK by the network operator, Scottish Hydro Electric Power Distribution plc ("SHEPD"). As part of The Scottish Strategy for Autism, Autism Network Scotland and ARC Scotland have been funded to run this learning event. The evening session is for parents and carers of a young person making the transition from children's to adult's services. See further down the page for an event for practitioners. Saturday 23rd July 2016 - at 2pm. On Saturday 30th July campaigning organisation 38 Degrees and the charity Campaign for National Parks are celebrating our nation's most beautiful landscapes. They're hosting free organised walks and natural art workshops at every national park in Scotland, England and Wales. We're delighted to announce that Cairngorms National Park and Loch Lomond and the Trossachs National Park will be part of the celebrations! Latheron Argicultural Society hold their annual show at West Clyth, Occumster, Caithness. Effective leadership is an important quality for sports leaders to develop. By strengthening the understanding of key leadership concepts, coaches and other volunteers are able to make an even bigger contribution in their communities. This programme is an ideal opportunity for people actively engaged in voluntary or part-time paid roles in sport / leisure, to develop their leadership and entrepreneurial skills and explore the potential of social enterprise in sport. You will gain insight from expert tutors and speakers as well as other learner experiences. The courses are fully funded. See inside for details of the courses which start in September in Wick and Thurso. The first batches of seaweed have been harvested and processed by a new food and drink business in Wick. New Wave Foods has invested £240,000 at its newly fitted out premises on the Wick Industrial Estate with support of £60,000 from Highlands and Islands Enterprise (HIE). The company turns wild-harvested seaweeds into edible products. A full-time harvesting and processing manager has already been recruited and two other new staff have been harvesting seaweed around the Caithness coast since April. Up to nine jobs will be created within three years. So many things to do this month for children and young people in al the main towns. Once you have checked the leaflet link above go to our What's On for events for everyone througout July. As Bill Fernie was at Lybster Gala this year he could not take photos at Castletown. James Annal has come to the rescue with his photos and Councillor Wilie Mackay who was on the stage has delivered them over to Bill Fernie who will upload them shortly. email any other photos for Galas and shows to bill@caithness.org to add to the photo galleries.